Many brides opt to hire out a calligrapher to do the handy work on their calligraphy wedding invitations. And it’s no surprise, as even our neatest handwriting can’t compare to the beauty and elegance of a calligrapher’s stroke. These calligraphy-inspired invitations might just compel you to leave the paper pieces to the professionals. The unique feature about this invitation suite is that all the calligraphy looks to be done with watercolor. It lends a certain softness that even the most delicate of pens can't capture and pairs well with the seaside theme of the suite. Every piece of this invitation suite uses calligraphy for a seamless style. The floral design is simple and pretty alongside the elegant copy. Although this invitation suite is mainly white, it’s a multifaceted style with its inclusion of calligraphy in various places. The combination of plain and elegant text makes this a unique twist on a traditional white invitation. This is another seaside-inspired design made even more beautiful with the use of calligraphy. Resembling a soft wave, the light blue letters seem to flow straight off the paper. This light purple and white invitation suite resembles the elegance of a Tuscan countryside wedding with its vintage appeal. The long curling letters and sloping shape makes even this simple style feel quite grand. This suite has many intricate pieces and details. But the one constant, cohesive element to them all, is the use of calligraphy. Even with a burgundy envelope, a blush invitation, and a black reception card, each piece looks like it belongs. 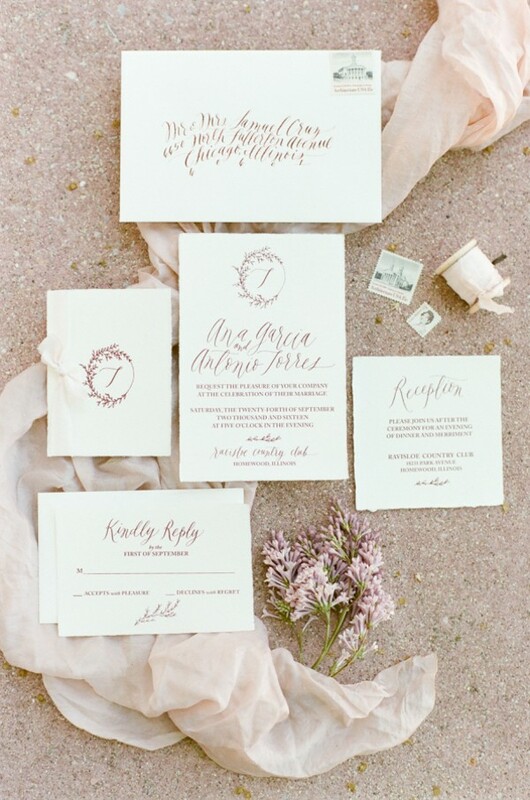 Calligraphy is definitely a trend making a huge comeback in the wedding world. Incorporating this technique into your paper pieces adds touches of elegance, style, and sophistication that truly withstand time.